Awards in the private and business sectors are a positive and inspiring factors of our modern society. The Pipestone Flyer has a proud tradition of writing primarily on positive topics, occasionally highlighting serious topics that challenge our residents and our communities. When we heard that a Bank in the City of Leduc was the recipient of a coveted award, we could not resist sharing that story. On Wednesday, October 22nd, the entire staff of the Bank of Nova Scotia in Leduc closed the bank doors at 2:30 (earlier than usual) to board a bus headed for Red Deer where high-profile awards for Alberta’s Central Region would be announced to a large crowd of Scotia bankers. 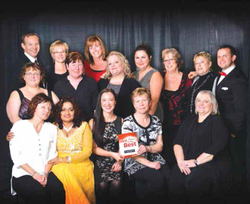 As you might have guessed by now, the Leduc Scotia Bank won 2nd place in the Best Of The Best Overall Rating category. An impressive accomplishment, display that award proudly, Scotia managers. When you walk into this bank, a red decor and a friendly receptionist greet you and she points out where you should go for the service you are seeking. Services such as investments, mortgages and everyday banking are provided by competent and congenial banking specialists. Renée Michaud is a skilled and caring Market Area Manager based in Leduc and she is obviously proud of the team that has contributed to this award. Tara Goddard is the manager of Customer Services. The Balance score Card is based on a four quadrants system with twenty-one branches of Alberta’s Central region competing for several honours. Shortly after having returned from the Red Deer Appreciation Night with most of her banking team, Ms. Michaud shared that, “We are proud to offer full service relationships. We have a great team atmosphere in our branch, along with knowledgeable staff and our clients see it and appreciate it.” In the attached photo, two banking advisors and two customer services staffers were missing, but the team was happy to attend the ceremony and to personally bring the hardware back to Leduc and to share it with their loyal Scotia Bank customers. Congrats, Scotia Bank. Keep up the good work!